Imagine being interred in a pub every single weekend. Every Saturday and every Sunday. Not bad proposition really if you were keeping the counter steady with your friends and enjoying the craic and a few beers. However if your working every weekend, after 16 years it begins to wear. That’s where canoeing saved my head. We started with an informal club in the pub. Heading out on Sunday afternoons, discovering, exploring and checking out new routes. 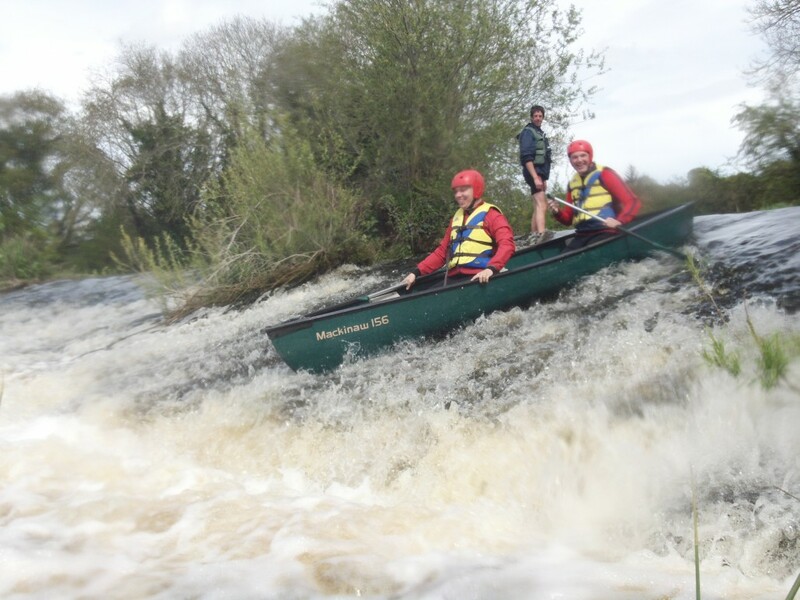 We, the lads and girls and myself had some spectular afternoons on the little Brosna between Roscrea and Birr and coming down the Delour river off the Slieve Bloom hills. Occasionally we might have had to check out the facilities in local hostelries. But stopping at what is know as the basin and shooting the weir where the Delour and Nore river converge was everybodys favourite. In big water the shoot was thrilling, a real adrenaline rush and that’s what got me hooked. It was that sense of wonder and adventure on each new stretch of water. What’s going to be around the next corner – a waterfall – a fallen tree – an old mill – the remains of a castle or old house that required further exploration. A giant set up rapids that will scatter us and get our hearts racing. I guess us lads never really grow up do we !! If I was ever going to get out of the family business this could be that ticket I was looking for. I would have to buy some canoes of my own, start a company, get all the gear, what about insurance, I’d need a trailer and a good strong car – might be an excuse to buy a jeep. Somebody said I would need to get on the internet – WHAT ? That was back in the early 90’s and that is exactly what I did. While doing my instructorship I discovered many new rivers and exciting routes I could brings groups. I slowly assembled enough equipment to start Celtic Canadian Canoeing and we were off. 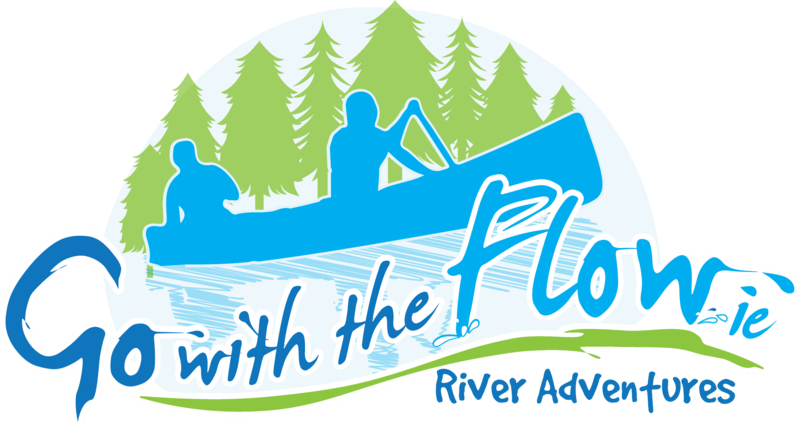 The fun and success of those early years was really spurred me on and very quickly Go with the Flow – River Adventures emerged. I am as excited now about taking a group on the river as I was 20 years ago. I just can’t wait. Every day is different on the river. The level of the water, the colour of the trees, the standing wave at the bottom of the weir, the swim down the rapids, will the otter be out, will we see the Kingfisher diving. If I’m really lucky I will have one of my sons or my daughter paddling and helping out. Yep – it’s a family business now. So the story continues and I would love for you to be a part of it. When are you going to open up that sense of wonder, fun and excitement, have a few thrills and spills, get back to nature and explore the treasures of our beautiful safe rivers. How about next weekend … my name is Charlie Horan, go on, give me a call !! I am an abstract artist, a concrete analyst, and a ruthless bookie. Critics worldwide swoon over my original line of corduroy evening wear. I don’t perspire. I am a private citizen, yet I receive fan mail. I have been caller number nine and won the weekend passes. Last summer I toured New Jersey with a travelling centrifugal-force demonstration. I bat .400. My deft floral arrangements have earned me fame in international botany circles. Children trust me. But I have not yet encountered you …… So what exactly are you doing next weekend ?